As Samuel Clemens/Mark Twain would say, If you don’t like the weather in North Carolina now, just wait a few minutes only he was talking about New England, but I think that this applies to anywhere these days and what do you do when the temperatures go from 80º day/night-time 30º’s you make soup! 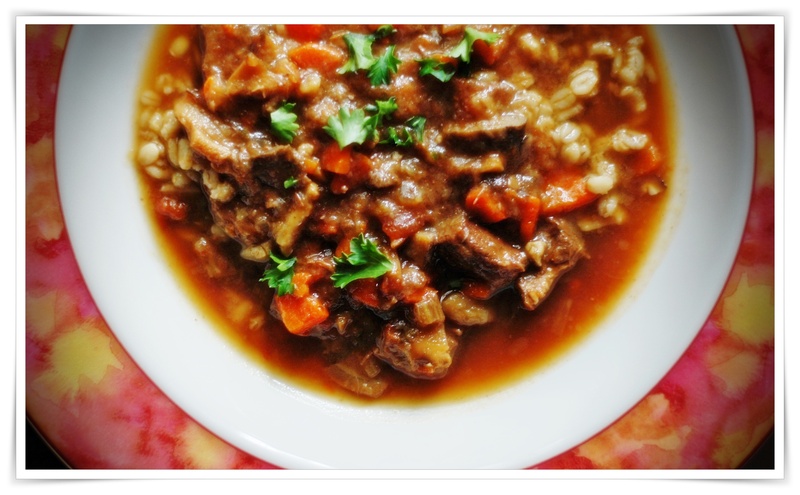 I have a standard recipe for beef and barley soup that is quite adaptable, but this week’s challenge at the club is “Pot Luck” from any of our chef’s on the list so it was easy to find a Mark Bittman’s Mushroom barley soup recipe that closely resembles mine and just as adaptable so I started with his basics. This hearty soup was perfect for the Instant Pot as well where you can brown the beef, add the rest of your ingredients and cook under high pressure for 30 minutes or so. I you don’t have a pressure cooker I have a version that I posted some time ago and the link is below along with Bittman’s…keep in mind that both recipes are very adaptable and today I added what I had on hand, a little porcini dust, quartered baby 4-6 ounces baby Bella mushrooms, mushroom broth, a good tablespoon of mushroom soy or premium dark soy sauce, two minced shallots, 1/2 of an onion, diced, and two pods of concentrated beef stock=7 cups of water. 1. Soak porcini in 3 cups very hot water. Put olive oil in a medium saucepan and turn heat to high. Add shiitake and carrots, and cook, stirring occasionally, until they begin to brown. Add barley, and continue to cook, stirring frequently, until it begins to brown; sprinkle with a little salt and pepper. Remove the porcini from their soaking liquid, and reserve liquid. Sort through porcini and discard any hard bits. 2. Add porcini to pot and cook, stirring, for about a minute. Add bay leaf, mushroom soaking water and 3 cups additional water (or stock, if you prefer). Bring to a boil, then lower the heat to a simmer; cook until barley is very tender, 20 to 30 minutes. Add soy sauce, and taste. Add salt if necessary and plenty of pepper. Serve hot.